Water dams have been known to fail with catastrophic consequences but in the last 40 years, failures have become very rare, whereas tailings dams have continued to fail. Is there something that can be learned from water dams to improve the safety of tailings dams? 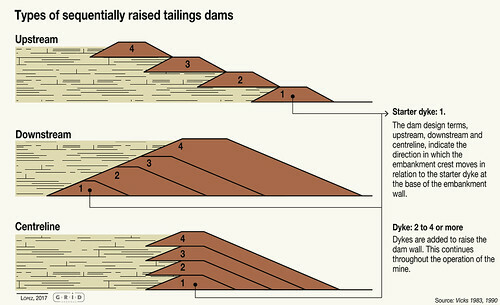 Unlike water retaining dams, where the dam wall is usually constructed from concrete or some combination of engineered rock fill and soil, most tailings storage facilities are built using designs that partially depend on the tailings themselves for support, a design feature not available to water supply reservoir dams (Chambers 2012). Other key differences between water-retaining dams and tailings storage facilities are: • Water-retaining dams are built to full height, then filled and operated; tailings storage facilities are usually built incrementally and operated during this incremental building phase. • Construction of a tailings storage facility may take many decades until it reaches final design height, with a single tailings storage facility often being used for the entire life of the mine. During the operational period of a tailings Storage dams – why are tailings dam failures more common than water dam failures? storage facility, there are likely to be many changes to the operating and management personnel, creating challenges that are often not addressed. • A water-retaining dam is regarded as an asset, typically for common use, while tailings storage facilities are seen as a cost – a means of storing waste rather than providing a service. For any form of publication, please include the link to this page and give the creator credit (in this case Kristina Thygesen) If the high-resolution file is not available, please contact grid@grida.no for request and permission for usage.